A layered sweet treat that’s perfect for the holidays – fast and easy too! 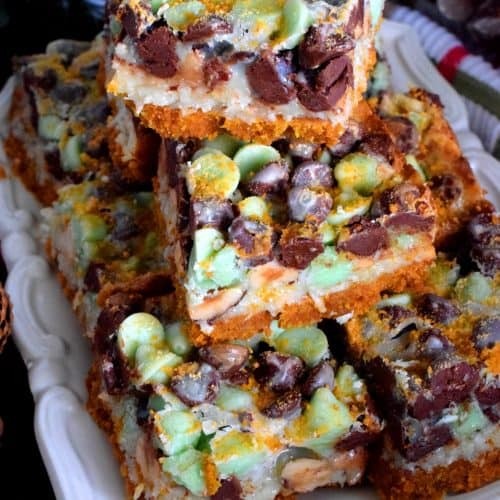 Dark Chocolate and Mint Chip Squares are gooey and messy, and perfectly addicting! Preheat oven to 350 degrees. Line a 8x8 inch baking pan with parchment paper. Set aside. Over medium heat, melt the butter in a sauce pan. Stir until the butter is melted, do not allow the butter to boil or sizzle. Stir in the mint extract and add the graham crumbs. Use a fork to mix the crumbs into the butter until thoroughly mixed. Transfer the mixture into the prepared baking pan. Press the graham crumb mixture into the pan, being sure to get into the corners. Try to get the base as evenly spread as possible, but do not press too hard. Evenly sprinkle over the coconut, followed by the macadamias, and lastly the dark chocolate and mint chips. Evenly drizzle the sweetened condensed milk over the top. Bake for 30 minutes. Remove from oven and allow to cool completely. Slice into 25 squares.